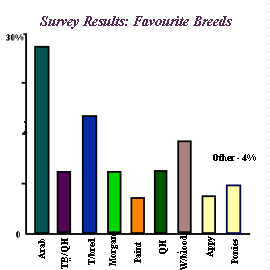 The results of the 'favourite breed of horse' section of Tisca's survey are finally ready (results from other sections coming soon)! Thanks heaps everyone who responded!! You can still answer the survey though, as these results will be updated. "They are so pretty and Fiery and brave" - Selena N.